Madrid born vocalist and composer Rebeca Vallejo is a most versatile and innovative performer. Known for combining her ancestral Flamenco roots, her deep love and understanding of Brazilian music, with the language of Jazz, Rebeca Vallejo deftly weaves all these elements into a sound that is truly unique. Rebeca's third studio album entitled "Azucar Canela" is a collection of 8 original compositions, two unique adaptations of Jazz standards and a "Buleria" interpretation of a Milton Nascimento's classic "Cravo e Canela. The album is being brought to life under the direction of Grammy Award Winning producer John Seymour (Santana, U2, Dave Matthews Band). "Azucar Canela" reaches beyond what's purely "entertaining" creating a unifying journey where three musical cultures, three countries (Spain, Brazil, US), and three different types of "blues" converge. Among the internationally sought-after musicians who participated in the recording of this album are Spanish Flamenco pianist Ariadna Castellanos, Brazilian percussionist Ze Mauricio, Argentinian pianist Emillio Solla, Spanish "cajonero" Jose Antonio Montana and Chilean percussionist Yayo Serka. In early 2007, Gruvoria attracted the attention of some of Canada's top musical tastemakers with their acclaimed second album Dirty Fuel. Now, guitarist & composer Blair Purdy and his 6-piece jazz-funk powerhouse are back with their third full-length album, The Sixth Knuckle. Gruvoria is a fascinating study in contrasts -- full of musical muscle, creative testosterone and edge, yet also playful and accessible to a wide range of music lovers. The band is comprised of some of the finest cross-genre players in Toronto, including: Purdy (guitar, composition & vocals), Ashot Grigorian (alto sax), Marcus Ali (tenor & baritone sax), Eric Boucher (keyboards), Ross MacIntyre (bass) and Vladimir Mladenovic (drums). The title of the new record references both Purdy's unique guitar style and his experience as a highly trained karate sensei and educator; the sixth knuckle is below the baby finger where the hand meets the wrist, and is one of the strongest and most resilient places from which to strike an opponent. The album was recorded live off the floor over a two-day span at Purdy's BPM Studios in King Township, Ontario; the music studio doubles as his dojo. In addition to the original songs, the album features covers of 'Times Like These' by Dave Grohl (Foo Fighters), the Headhunters classic 'Daffy's Dance' and 'Friar Laurence' by legendary classical composer Sergei Prokofiev. Yes, you read that correctly -- a jazz-funk version of Prokofiev! 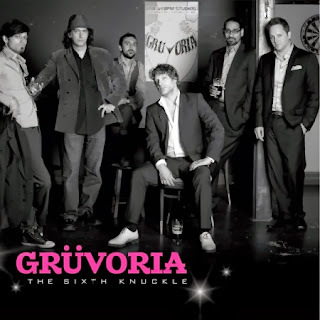 Griuvoria's club and festival resume includes the Toronto Downtown Jazz Festival, Beaches Jazz Festival, the Festival of Friends (Hamilton), Lula Lounge, Trane Studio, and Supermarket. They have shared the stage with the likes of Elizabeth Shepherd, Souljazz Orchestra, Burnt Sugar: The Arkestra Chamber and Kobo Town. The band is also highly in-demand for private parties and events, particularly in the film industry. This reissue of Benson's 1968 Verve LP is worth the price of admission just for three of the small-group cuts. "Billie's Bounce," "Low Down and Dirty," and "Thunder Walk" find the guitarist stretching out in the company of Herbie Hancock, Ron Carter, and Billy Cobham on an uptempo Charlie Parker blues, a gutbucket slow blues and a deeply blue hard-bop groove tune, respectively. 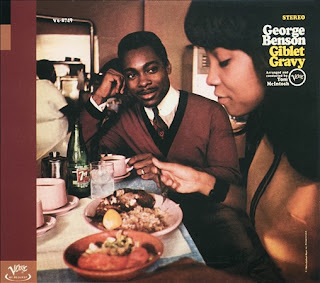 This recording sits right between Benson's early small-combo records as a leader (COOKBOOK and IT'S UPTOWN) and his move to even more heavily produced recordings for CTI. The grooves are groovy, the horns are punchy, and the then-future of jazz guitar makes his way through the charts as feature artist, laying down the head, shadow boxing with the swaggering arrangements for a chorus or two, and getting out in a radio-friendly two minute and fifty-nine seconds. Plus you get to hear Benson and Hancock duking it out like they mean it on "Low Down and Dirty." All tracks have been digitally remastered. This is part of Verve's By Request series. Recorded at A&R Recording Studios and Capitol Recording Studios, New York, New York from February 5-7, 1968. Includes liner notes by Nat Hentoff. Reissue producer: Bryan Koniarz. Personnel: George Benson (guitar); Tom McIntosh (conductor); Eileen Gilbert, Albertine Robinson, Lois Winter (vocals); Pepper Adams (baritone saxophone); Jimmy Owens (trumpet, flugelhorn); Ernie Royal, Snooky Young (trumpet); Alan Raph (bass trombone); Herbie Hancock (piano); Eric Gale, Carl Lynch (guitar); Ron Carter, Bob Cranshaw (bass); Billy Cobham (drums); Johnny Pacheco (congas, tambourine). Producer: Esmond Edwards. Q (1/01, p. 122) - 3 out of 5 stars - "... There's a soul element here.... Go straight to be-bop blues classic 'Billie's Bounce' or the 'What's New' alternate takes for modern jazz guitar at its finest."